This is my no-fail, foolproof dinner that’s easy to make and feels like fine dining. Don't like squishy mushrooms? Just chop them up really fine. Mushrooms are immune system boosters. Serve over rice or noodles with a vegetable on the side. In a large pan, sauté chicken in 2 teaspoons hot oil over medium-high heat for 5 minutes. Sprinkle with salt & pepper, stirring a few times. Remove to a foil-lined bowl. Reduce heat to medium, add 1 tsp. oil and saute onions for 1 minute. Add mushrooms, cook & stir until soft, about 4-5 minutes. Whisk flour & milk together and add, with 1/2 tsp. salt & pepper. Bring to a boil, reduce heat and cook until thickened, about 2 - 3 minutes. 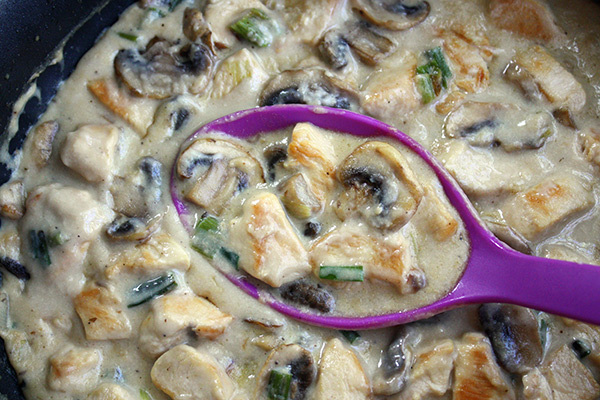 Stir in chicken with its juices. Serve over rice or noodles. 11 Comments on "Easy Chicken & Mushrooms"
I am Polish too but lost some of the favorite recipes (Mom’s, Babcia’s, and other relatives.) So glad I found you. I just trust everything you make and I love watching your videos. So honest and no difficult-to-find ingredients. Love the ribs and EVERYTHING ELSE! Thanks for maintaining the website. Even though it’s not Polish, I will be trying the pizza. Can’t resist the easy crust. This recipe was so easy but tastes like it took hours. Thanks Jenny! Seeing this long after the initial conversation, but I have a Cajun recipe similar to this one, but it calls for sour cream and chicken stock, then adding a little white wine instead of the milk (Justin Wilson recipe/popular in the early 70s on PBS). Simmer with sour cream and chicken stock covered until chicken is done. Add a little white wine and simmer uncovered for about 8-10 minutes. It’s also served over rice or noodles. Made this tonight. It was flavorful, but the sauce was thinner than I thought it would be so I served it as a soup. Is the sauce suppose to be thicker? It’s not a thick sauce but it should be nowhere close to a soup. If you used fat free milk, it might have caused the sauce to be too thin. I’ve been making this dish for years and for me, the sauce is just right to coat the chicken and stir into the rice to make it creamy. Assuming you did not change the recipe, feel free to use a little more flour. When I need a recipe I check with Jenny. I am never disappointed . Delicious! So easy and tastes as if I purchased it – so flavourful! I love all the recipes that I have attempted so far. I love this recipe! Its super easy to make. The only downfall is that there is never any left overs. It doesnt matter if I double or even triple this recipe, its always GONE! My family really enjoys this meal. Thank you Jenny!